Hurll Nu-Way Pty Ltd presents the Blackheat U-tube and linear low intensity radiant heaters from Roberts-Gordon. Roberts-Gordon specialises in a comprehensive range of high-efficiency radiant heat solutions including gas radiant heaters that find application in diverse environments from restaurants and cafes to industrial workshops and livestock sheds. 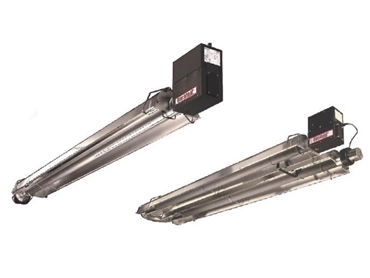 Blackheat U-tube and linear low intensity radiant heaters are designed for fuel efficiency, quick heat recovery, low heating and electricity costs, minimal dust movement, uniform zone controlled heating, flexibility of design, environment friendliness and reliability as well as aesthetics. Blackheat radiant heaters are ideal for restaurants and cafés, livestock farms, manufacturing facilities, recreational facilities, school halls, airport hangars, packaging and cargo facilities, retail showrooms and outlets, atriums, grandstands, churches, loading docks, fire stations, offices, showrooms, vehicle service facilities and vehicle wash stations. Roberts Gordon infrared radiant heaters provide the ideal heating solutions for the winter with their aesthetic design fitting in neatly with architectural lines. The environment-friendly gas heaters use natural or propane gas for low emission heating. The reliable infrared heating range delivers long-term reliability with minimal maintenance requirement. The infrared radiant heaters are particularly ideal for livestock farming and agriculture with radiant heating considered a proved method to improve animal welfare and reduce production losses. The gas heaters help to keep floors dry and create minimal dust movement. Roberts Gordon infrared radiant heaters suit the needs of large workshops where they can be installed at heights up to 25m to keep the floor area clear for equipment while also keeping workers warm.